NJ Kids Movie Review: Home – A Cute, Colorful Children’s Movie. An alien named Oh who is on the run from his own people lands on Earth and makes friends with the adventurous Tip, who is on a quest of her own. SYNOPSIS: An alien named Oh who is on the run from his own people lands on Earth and makes friends with the adventurous Tip, who is on a quest of her own. REVIEW: Based on Adam Rex’s children’s book “The True Meaning of Smekday,” this cute animated family movie centers on an alien race known as The Boov. But every time their archenemies, The Gorg, find them hiding somewhere new in the universe, The Boov are forced to find a new host planet. This time, The Boov are headed for Earth, but the earthlings are not all that happy when the little aliens vacuum up all the people and send them to Australia. Plenty of space there, right? All that Outback? But not so good for people like young Tip (voiced by Rihanna), who ends up separated from her mom (Jennifer Lopez). Fortunately, Tip finds an unlikely pal in Oh (Jim Parsons), a friendly Boov who’s a bit of an outcast with his own kind. Which is kismet, because Tip has that same problem here on Earth. Together, the two form a bond and set about trying to find Tip’s mom and, of course, save the planet. 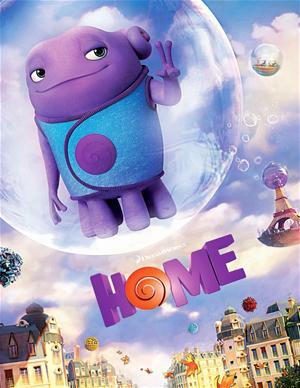 I’m not sure that “Home” will go down in cinematic history as one of the best family movies, but it’s bright and colorful, with plenty of action that little ones will love (at least, the little ones in the theater where I saw the movie loved it). The story isn’t particularly original, but DreamWorks somehow manages to turn aliens taking over the planet into a cute and non-threatening storyline. The voices are well cast, from Rihanna’s sweet but independent girl to Jim Parsons’ funny dialogue (“Among The Boov, I do not fit in,” he says. “I fit out.”) to Steve Martin as The Boov’s clueless leader to Jennifer Lopez as Tip’s caring mom. And there’s also Tip’s cat, a funny feline who does things like jump on Oh’s head and start purring, which makes the alien think something is horribly wrong. In summary, “Home” is a solid children’s movie that will keep little ones entertained for 94 minutes. Violence/Gore: Massive alien spaceships invade Earth. A main character appears to die at one point. Tip is separated from her mother, which might upset very young viewers. Which Kids Will Like It? Kids aged 6 and older who like cute, colorful animated movies. Will Grownups Like It? Though somewhat forgettable, “Home” features beautiful animation and important messages about tolerance, friendship and individuality.